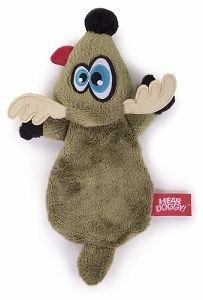 Ultrasonic, super soft, silent squeak plush toy that only dogs can hear! 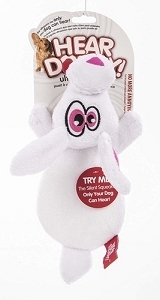 Ultrasonic HEAR DOGGY!® toys are made with a squeaker ONLY your dog can hear! Hear Doggy! plush toys give your pet the same sensation and enjoyment of traditional squeaky toys without the irritating noise! The science behind Hear Doggy! : Dogs can hear sounds at a higher frequency (0 to 45 KHz) than humans (0 to 20 KHz). Tuned to an ultrasonic range in the 24-28 KHz frequency, each Hear Doggy! squeaker is out of human hearing range, but still fun for your four-legged friend.